Movie Beards: Rocky Balboa: "Rocky IV"
To most, Rocky IV is the movie in which Sylvester Stallone gets in a boxing match with He-Man to promote world peace. It's also known as the Rocky film in which he buys a robot and grows a beard. The basic premise of the movie finds the Italian Stallion fighting in Russia to defend the death of his nemesis/friend/beach montage buddy Apollo Creed, who so happens to be the fourth man to step foot on Earth's moon. Creed fell victim (aka died) to a devastating beating from Ivan Drago, a Russian super-fighter designed in a laboratory specifically to break you. Rocky must montage his way to victory by outrunning cars, chopping logs, climbing mountains, and growing the Montage Beard. The Montage Beard is a powerful, yet, rarely used tool in the sports and action films of the 1980s. In Rocky IV, the Montage Beard indirectly represents the duration of time. It gives the audience an insight as to how long Rocky has been in that cabin. He hasn't been punching underneath taut ropes and lifting nets of rocks with a pulley for just a couple of days. Depending on the rate of growth, Rocky has been training for weeks, or at least long enough to grow a healthy Montage Beard. 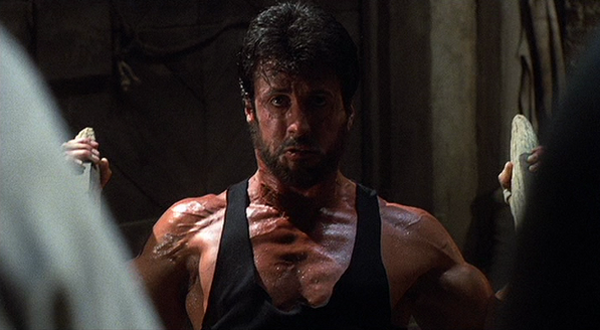 Bear in mind, Rocky has been growing this beard over the duration of two training montages (there are three montages in the film). It also doubles as a Nature Beard so his face could fight something (winter), too. You want to know the primary advantage of the Montage Beard? Compare Rocky's physique throughout the entire series. He's pretty ripped by the time he body slams Hulk Hogan in the third film, but he manages to obtain a negative body fat percentage in Rocky IV. That's right. Sylvester Stallone got in the best shape of his life simply by growing a beard. That's the power of the beard, folks. It takes a lot of calories to maintain a decent beard. It's pretty much impossible to gain (or keep) anything other than solid muscle if you're training while growing a beard. But because the beard is such a source of manliness, it avoids sapping nutrients excessively and making its wearer scrawny (that is, you'll retain muscle even while eating a little less).